MainAll NewsDefense/SecurityHave Kidnappers Breached Border on Way to Gaza? Have Kidnappers Breached Border on Way to Gaza? Video shows Arabs from Hevron area infiltrating security barrier despite IDF clamp-down on area where teens thought to be held. Damning video evidence reveals that Arab residents of Hevron in Judea are succeeding in illegally entering Israel, raising fears that the kidnapped teens may possibly be being moved out of the region towards the Hamas-enclave of Gaza. The video, reported by Walla!, documents dozens of illegal Arab entrants breaking over the security border with no resistance near Kibbutz Lahav, right over the 1949 Armistice lines to the immediate south west of Judea, north of Be'er Sheva. The group of Arab illegals are seen in the video meeting two cars that were waiting for them at the location near the security border by Kibbutz Lahav, hopping on board to be whisked off to possibly anywhere in the country. One of the Arab men is seen left behind, apparently due to a lack of space, and proceeds to return towards the border to break back through towards Hevron. While the illegal breach is a problem known to security forces for some time, the video reveals that the phenomenon continues now in the second week of Operation Brother's Keeper, which is focusing in on the Hevron area, due to intel information hinting that the three teens kidnapped by Hamas terrorists are being held in the area. "For years I've been warning that the writing is on the (security) wall, as hundreds of Palestinian illegal entrants cross the border each week," said Sigal Moran, head of the Bnei Shimon Regional Council where Kibbutz Lahav is located. "A resident of Susiya was killed chasing them, an IDF captain was beaten by those aiding the illegal entrants. The day isn't far when Israelis will be under the threat of abduction to the (Palestinian) Authority territories. How long will the state of Israel show a slack hand?" asked Moran. Residents of the region suggest that the ongoing border breaches generally are perpetrated by local Arabs who enter looking for illegal work, but quite often the freedom of movement is also manipulated by terrorists. That danger is particularly highlighted given the search for the kidnapped teens and their kidnappers, which has led to a supposed military closure of the Hevron area that nevertheless was proven to be ineffective by the video evidence. Walla! 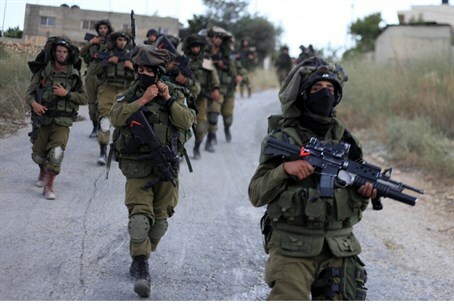 reported that the Defense Ministry said the incident is under the responsibility of the IDF. The IDF responded that "this is a multi-system issue that relates to several organizations. Since Operation Brother's Keeper began there has been a significant decrease in the phenomenon of illegal entry breaches." "In recent days in some of the locations work has been started to close the breaches according to the estimation of the security situation," added the IDF. The operation to locate the teens - who Israel says were abducted by Hamas - has also involved a crackdown on the Islamist group itself and so far seen the arrest of over 369 Hamas terrorists, 57 of whom were released in the 2011 Gilad Shalit deal which freed a total of 1,027 terrorists. Additionally, 65 Hamas institutions in Judea and Samaria have been closed, and over 1,800 houses have been searched. However, a Security Cabinet decision was reached on Tuesday to scale down the IDF operations against Hamas and limit the mission to locating the teens, over concerns of heightened violence in the upcoming Islamic holiday month of Ramadan beginning Saturday.